Luxury Liner Row, with Brian Hawley at the helm, has proven time and again to be a prime source for quality ocean liner memorabilia. Brian has placed many rare and unusual items in my Mauretania collection. Whether it is a section of first-class molding, a unique photograph, reference books, or a crew member's Christmas card, Brian's knowledge, contacts, and experience allow him to regularly offer those items no one else does. The communication and related services provided are excellent. I recommend him. 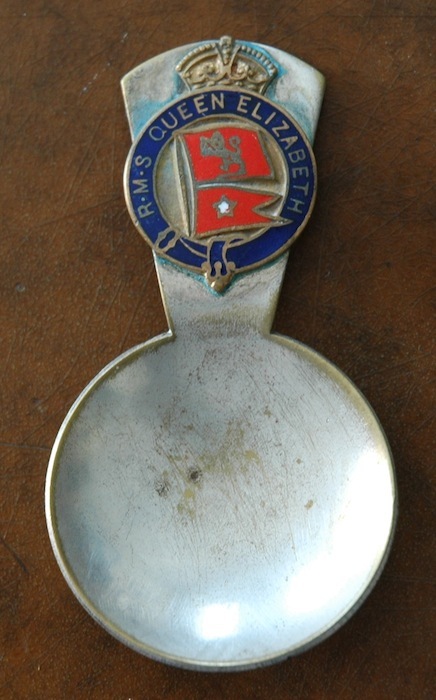 Silver loose-leaf tea spoon as sold in the souvenir shop on the great Cunarders. 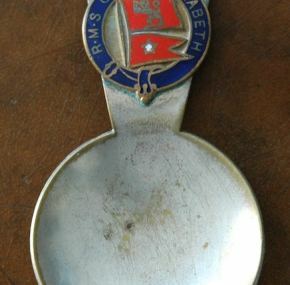 No damage to the enamel or to the silver plate. These display nicely as does just about everything from the gift shop!